Just across the Bay from Naples lies the Sorrentine Peninsula, perhaps the most stunning stretch of coastline anywhere in the world. With its beautiful location on the north coast of the peninsula, the small community of Sorrento is perfectly situated looking out over the Bay of Naples, Mount Vesuvius, and the Isle of Capri. It is hard to imagine a more perfect setting than this. Famous for its lemons and limoncello, Sorrento has much to offer its visitors and makes for a great base from which to explore the region. While there is certainly much more to do and see than I have listed here, this makes for a great start to experiencing this wonderful region of Italy. With its beautiful clock tower, the Cathedral of Sorrento is easily recognizable and is centrally located on the Corso Italia, the main thoroughfare in the heart of Sorrento. 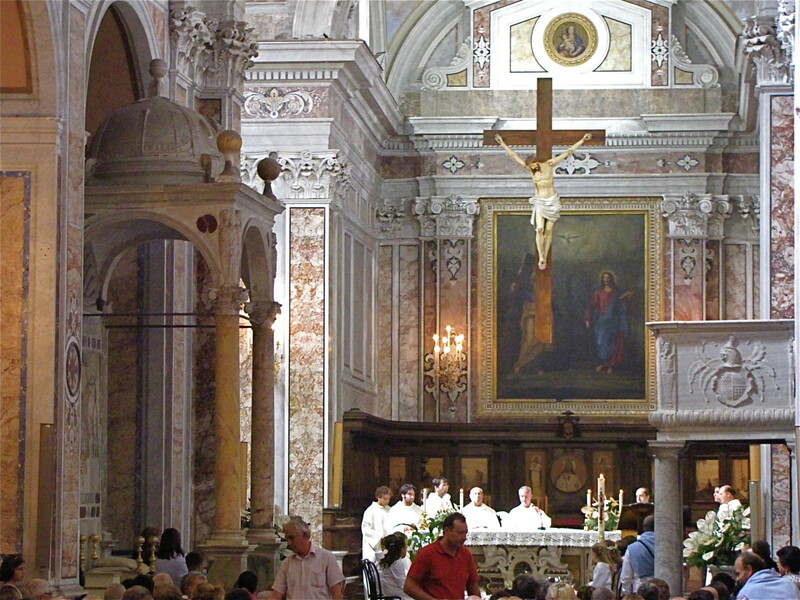 The interior of the Duomo, as it is known, is in sharp contrast to the simple exterior of the church and treats visitors to some wonderful frescoes and a dramatic altar with a crucifixion above it. We were lucky enough to attend a mass in this beautiful cathedral and it is certainly worth a visit. The old section of Sorrento is a wonderful place to get lost in its narrow streets and alleyways. Here you’ll discover colorful shops and quaint trattorias and the true essence of Sorrento. Spend a few hours wandering this section of town and you’ll know why Sorrento is such a popular destination. The old town centre is home to numerous historical buildings including the Basilica of Sant’Antonino and the complex of San Francesco, which includes the church, cloister, and a convent. Looking for a spot to just chill and relax for a bit? Grab a table at one of the café’s here on the Piazza Tasso and watch the coming and goings of Sorrento. Piazza Tasso is undoubtedly the hub of activity in Sorrento and a great location to find a seat and get off your feet for a spell. 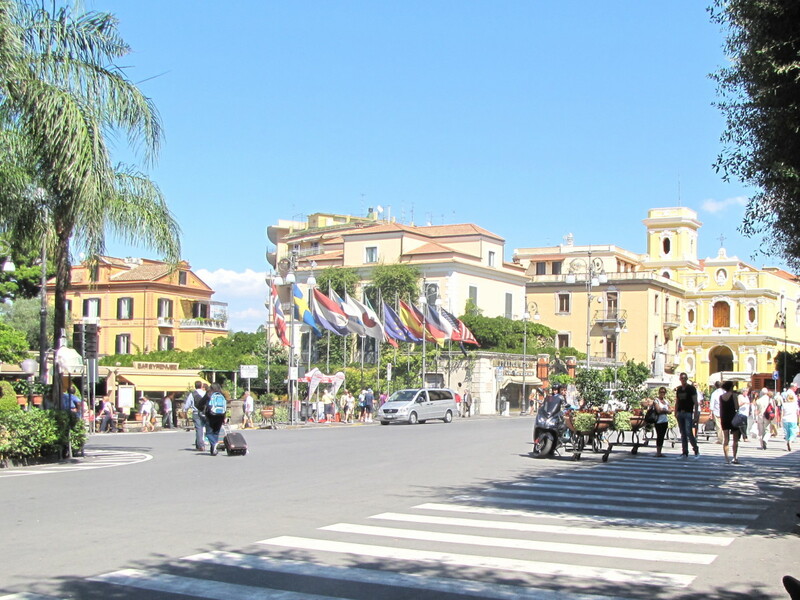 The piazza is surrounded by shops, cafes, fruit stands and horse drawn carriages waiting to take visitors on a leisurely tour of Sorrento. It all makes for a non-stop symphony of colorful activity. Hop on the circumvesuvian train and in a quick thirty minutes or so you’ll be on the doorstep to Pompeii or Herculaneum. 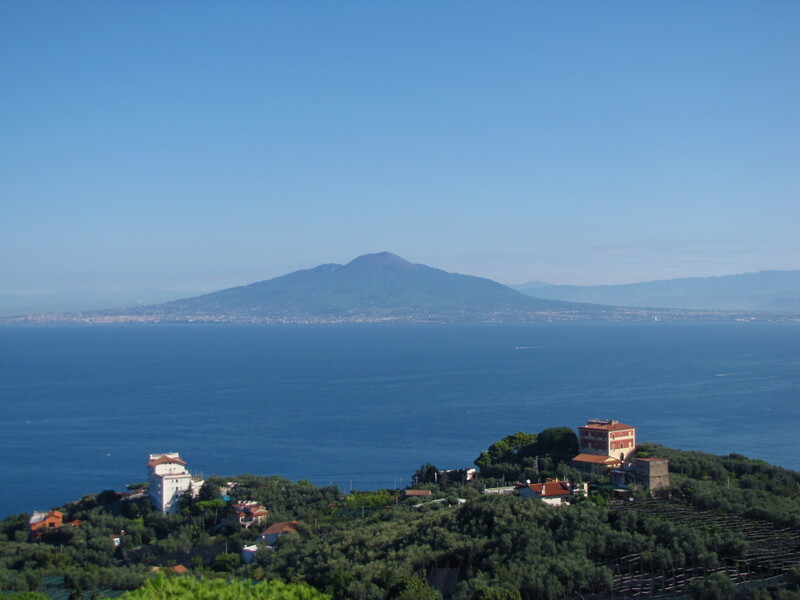 Spending some time at either of these archaeological sites is a must for any trip to the Sorrento area. The famous ancient city of Pompeii is constantly unearthing new finds and it is fascinating to walk among the ruins of what was once a thriving community. Great views of Mount Vesuvius make one realize just how close to the mountain this community was and why there was no escaping its fury. One of the highlights of our trip to the Sorrentine Peninsula was a day trip out to the Isle of Capri. 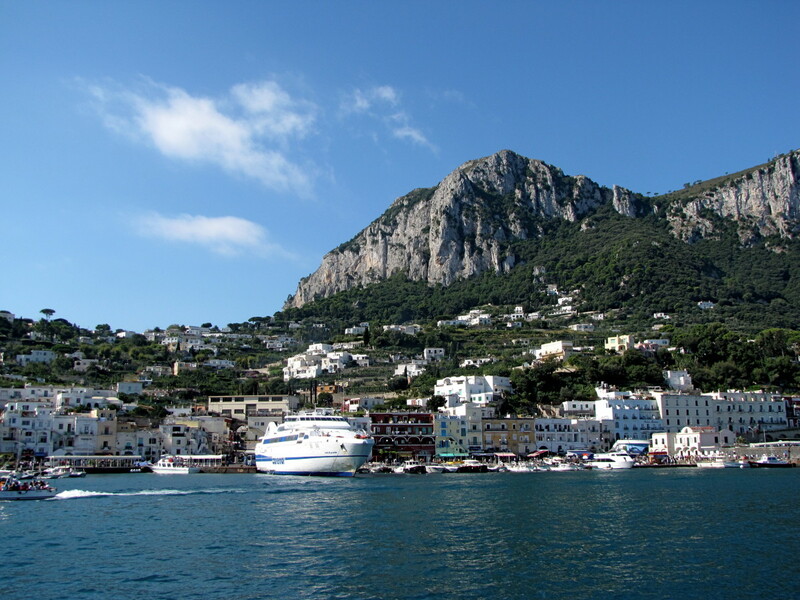 Catch the ferry from Marina Grande and in no time you’ll be cruising into the port of Capri. For something a little different book a private boat tour of the island. We did this right upon arriving in Capri and got to see all the grotto's that most visitors will miss out on. I know everyone wants to see the famous Blue Grotto but it’s expensive and very time consuming. Instead we opted for a private boat tour of the island and got to go into all of the other grotto's and even swim into some of them. This was definitely a highlight and an unforgettable experience. If you plan your day out in advance you can take a boat tour in the morning and then spend the afternoon strolling through the communities of Anacapri and Capri. Or take the chair lift to the top of Monte Solaro for a stunning 360 degree view of the island. If there is one thing that you must do when visiting Sorrento it’s head to the Amalfi Coast. Sorrento makes for a great base from which to do this and the SITA buses run throughout the day from Sorrento to Amalfi. For a different approach hop on the ferry and get a unique look at Positano as you approach from the sea. 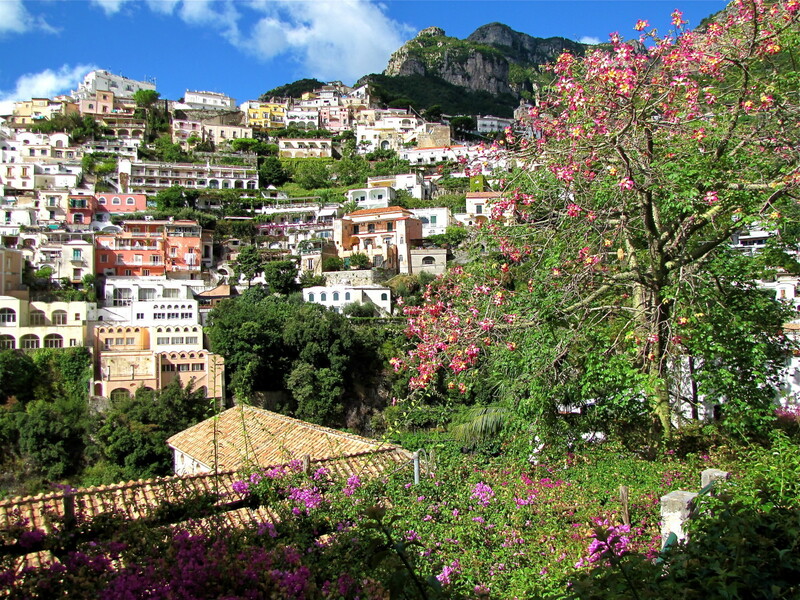 The communities of Positano, Amalfi and Ravello are all beautiful and worthy of a visit. If time permits visiting only one then by all means make it Positano. This stunning seaside community is built right into the side of the mountain and offers a dramatic landscape. The main attraction, however, is the famous Amalfi Drive which offers up some of the most amazing coastal scenery in the world. If you’re feeling adventurous then rent a car for a day and take a drive on this twisting, cliff hugging drive. Find the Church and Cloister of San Francesco and admire its arches and architecture, which date back to the fourteenth century. 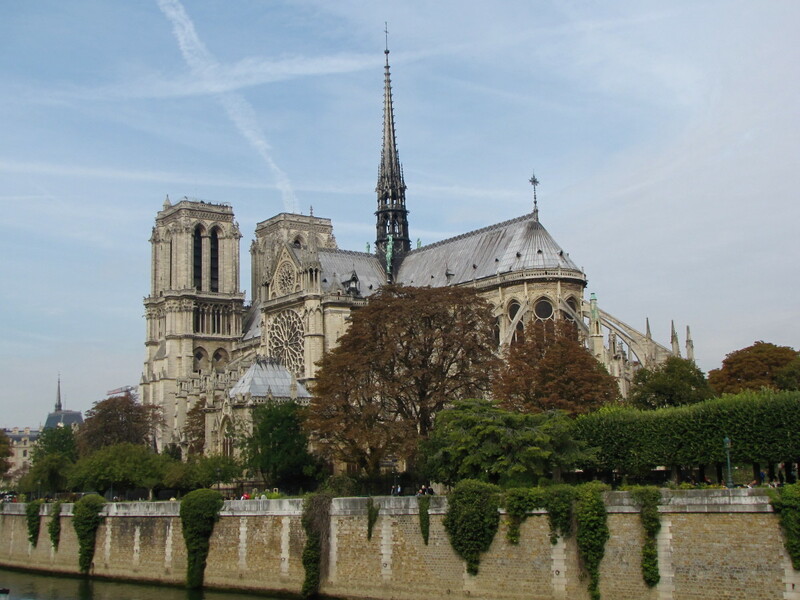 A Convent and the Cloister are nearby and both were also dedicated to Saint Francis. Occasionally there are classical concerts held at the cloister in the evening during August and September if you happen to be lucky enough to be visiting when one is scheduled. 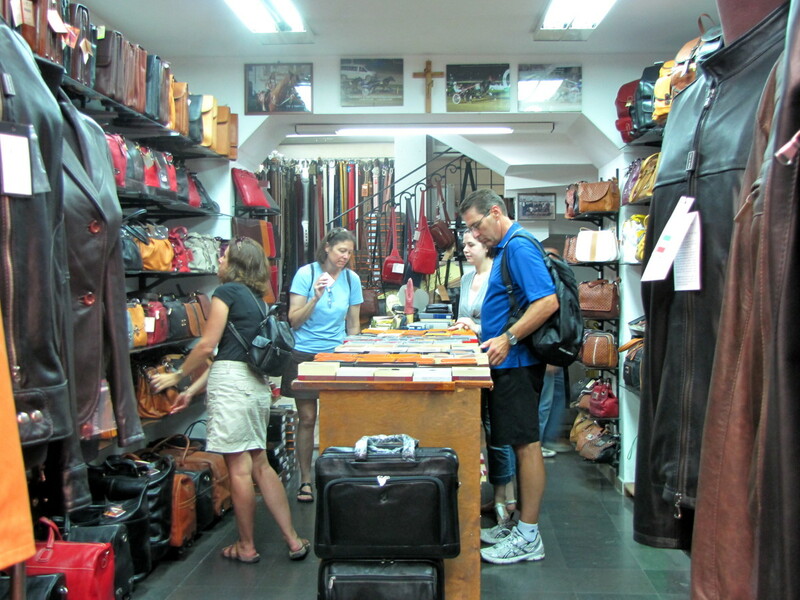 Shopping in Sorrento can be a fun and enjoyable way to spend an afternoon. Visitors will find a wide variety of small shops offering everything from leather goods and ceramics to jewelry, locally grown fruits and vegetables, and anything lemon. 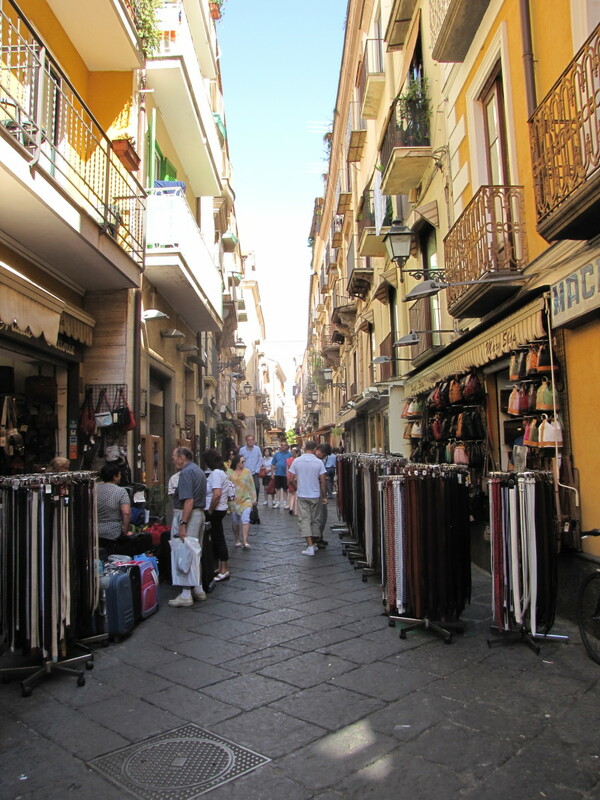 Good shopping opportunities can be found all along the Corso Italia which is the main roadway through town. To find the quaint mom and pop shops head off of the Corso Italia to the backstreets of Sorrento. Whether you are looking for something particular or just browsing it’s a great way to discover the heart of Sorrento and get a flavor for this small community. Take a walk down to the Marina Grande and Marina Piccola for a different perspective on Sorrento. The easy walk down the cliff will be not so easy on the return trip but it’s worth the effort. Marina Piccola is the main port of Sorrento and where the ferries to and from Capri, Naples and Amalfi dock. Marina Grande is the old, former port of Sorrento that is now a quaint fishing village with excellent seafood restaurants and rustic homes and shops. 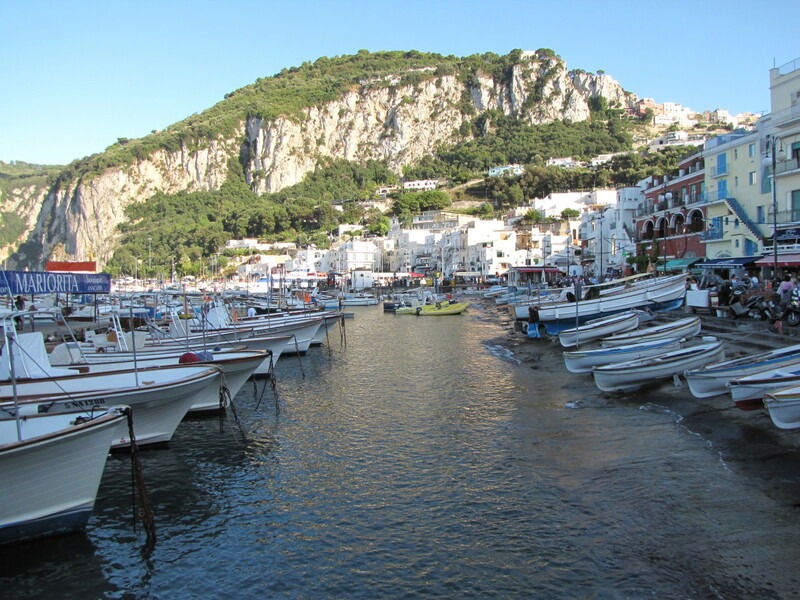 If you are planning a ferry trip to Capri or the Amalfi Coast while visiting Sorrento you may want to get your tickets early and familiarize yourself with the marina so you know where you are going when the time comes. While down here grab a bite to eat at one of the local eateries or watch the fisherman bringing in their catch of the day. Hop-on hop-off bus tours are becoming quite popular across Italy and for good reason. They offer a great opportunity to see the city at your own pace. As advertized, you can hop off at anytime and hop back on when you are good and ready. In Sorrento the buses traverse a route that takes about an hour and forty-five minutes and they leave each of the seven stops every hour or so. The buses are open-top double-decker buses and usually have a running commentary of the sites as you travel around the city. Tickets cost about $15, which makes for an economical way to see Sorrento and learn about its culture and history. Hopefully you enjoyed this brief glimpse of Sorrento. 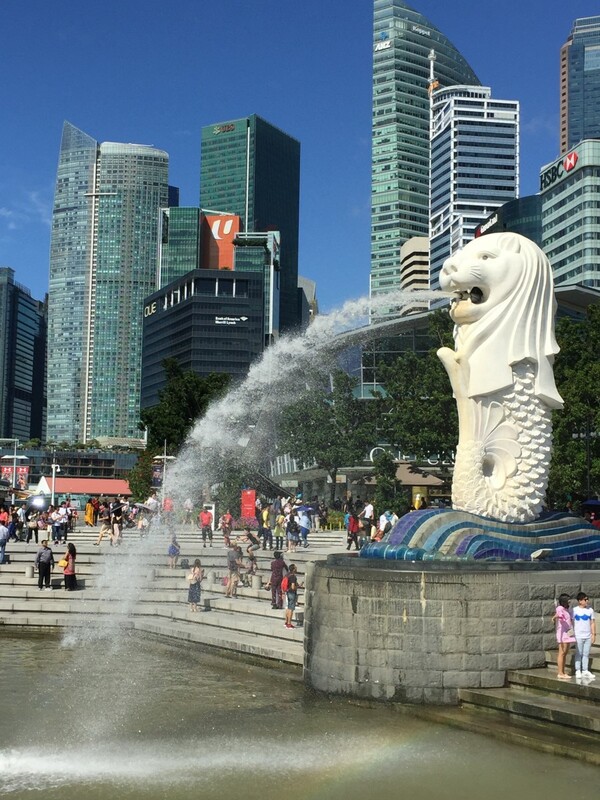 Visitors can easily spend a full week just in this area in order to see all of the major sites that it has to offer. If your time is limited then pick and choose what interests you the most but a trip down the Amalfi Coast should not be missed. The scenery here is certainly one of the main attractions and something that you will not soon forget. Planning a trip to Taormina? Discover all there is to see and do in this comprehensive guide to the jewel of Sicily. Taormina has something for everyone and is considered one of the most beautiful locations in all of Italy. Your guide to visiting the beautiful Amalfi coast. Travel along this twisting, mountain hugging road all the way from Sorrento to Positano, Amalfi, and on to the city of music, Ravello. What’s the weather like in Sorrento, Italy in October? The weather can still be very nice in October with high temperatures reaching the mid 70s Fahrenheit. Certainly things cool off as the month progresses but we have had very nice weather in mid to late October on previous trips. We are visiting Sorrento at the end of April for 10 days & will certainly take the details for the boat trip to Capri with us. Could you give me an idea of the cost of this trip & should we book in advance? For the ferry trip out to Capri, the cost will depend on whether you take the hi-speed hydrofoil or the regular ferry. I believe the cost each way is about 16 euro for the regular and about 20 for the hi-speed. I would definitely book this at least a day or two in advance as the ferries only hold so many people and can sell out although in April you will probably be okay. We purchased our ferry tickets the day before and didn't have a problem. The issue with buying them months in advance is you will want the day you go to Capri to be nice weather wise so you probably don't want to commit too far in advance. I wasn't sure if your question was in regard to the trip out to Capri, or the boat ride around Capri once we got there so I'll address both. As for the boat ride around Capri we did book that well in advance. These small tour companies only have so many boats so we did book this ahead. Now, the problem becomes what if you don't know which particular day you want to do this and what if the weather is not good on that day and you want to go on a different day? That's where working with Wendy's Capri Whales was so easy. She told us that when we got to Sorrento and decided on a day that was good weather-wise to just call her and she would take care of us. Super easy. But, if this is something you are thinking of doing certainly try to have them hold a spot for you when you are there and she will work with you. I am heading to Sorrento in a few weeks, and I liked your suggestion of a boat trip to explore Capri. Can you suggest a vendor? Yes, we used Capri Whales di Wendy and enjoyed every minute of our tour around the island. We explored grottos that most visitors don’t even know exist. Wendy, the owner, is very accommodating and was easy to work with. Look them up online. How do you get from Naples to Sorrento, Italy? You have a number of options. You can take the train, bus or ferry. 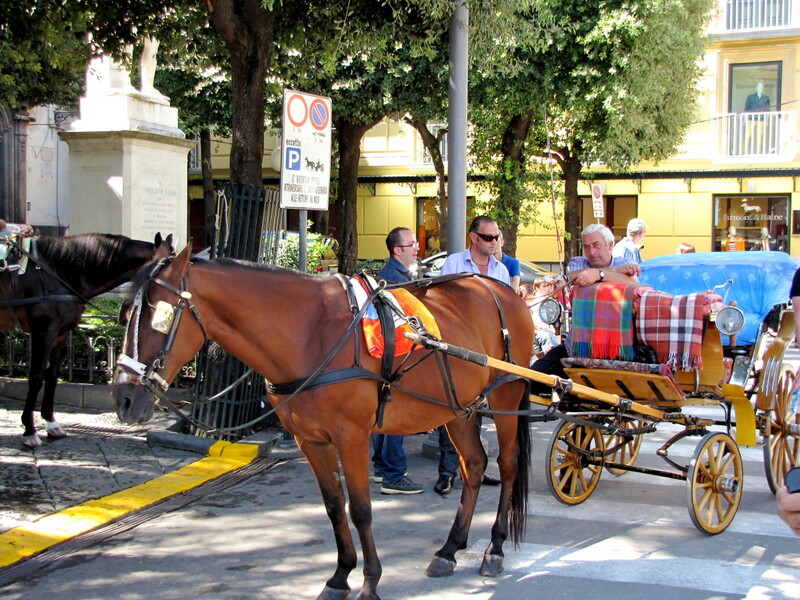 You can even hire a driver to take you to Sorrento as it’s not very far. If the weather is nice I would opt for the ferry. The views from the water of the coast and Mount Vesuvius are amazing. I'm planning to travel to the Amalfi coast at the end of April. I have some questions: 1. How is the weather? 2. 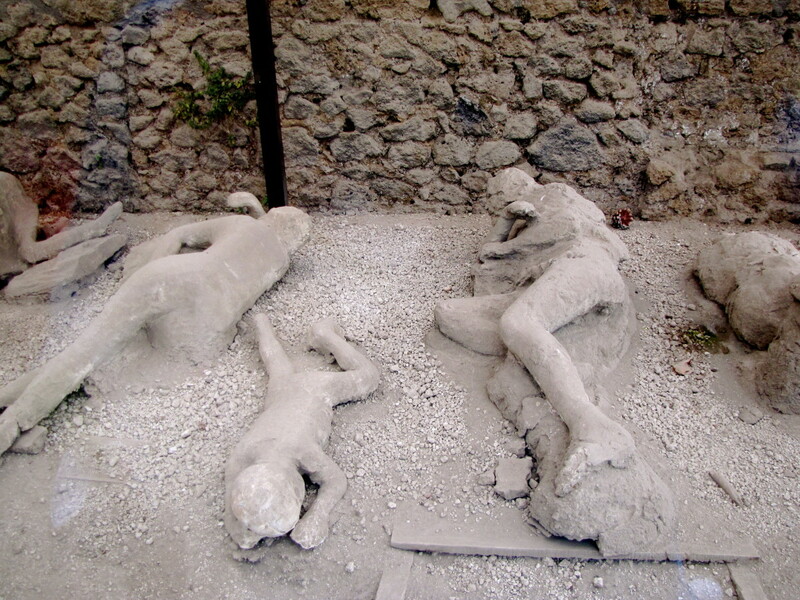 Where is the best place to sleep if I go to all the places mentioned besides Pompeii? 3. Should I rent a car for the whole week? 4. Do you have good hotels to recommend? By the end of April, the weather is starting to warm up. The average daily high temperature is about 70 degrees. Of course, it’s always up to the weather gods so check before you leave. We have used Sorrento as a base when visiting the Amalfi Coast. It’s a very convenient location with buses that run up and down the coast. Also, Sorrento is an excellent location for catching the ferry to Capri if that interests you. We like the Il Nido Hotel located in the hills above Sorrento. 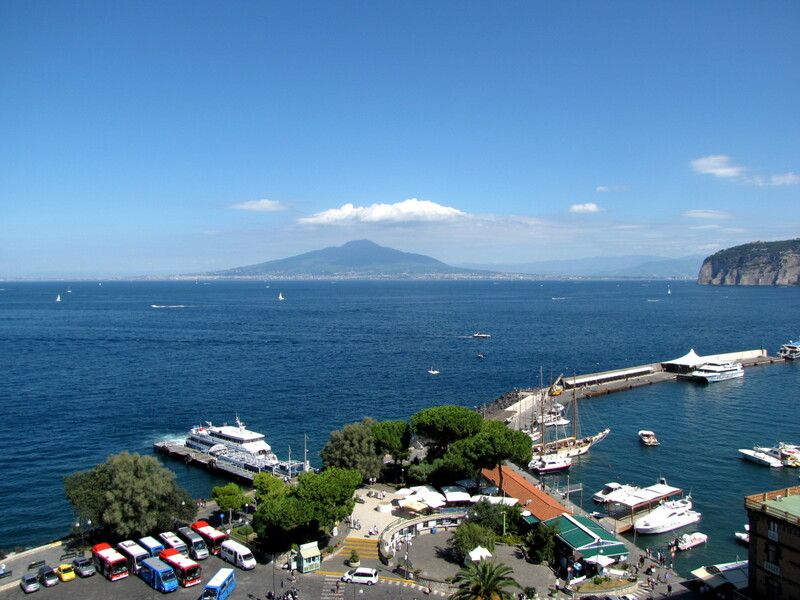 There are great views of the bay, and they have a shuttle to and from the center of Sorrento. As far as the car, it depends on your desire to drive the Amalfi Coast. We drove to Sorrento and parked the car at the hotel for the week, then never used it. Between the hotel shuttle and the local buses, we were fine. It saved us the trouble of driving and trying to find parking. Good luck, it’s a beautiful area. We will arrive at Sorrento at 12:30 pm on May 4th, and leave early on May 6th. We can do a full day to Capri or go to Positani, Amalfi, Ravello. We would try to do half a day visit on one of those two as well. Which one would you recommend doing for a full day and which one for half a day? What's the weather like in Sorrento in April? It can be nice, with temperatures in the 70s during the day and 50s at night. Of course, you never know what to expect with the weather and early spring can be unpredictable. One advantage of visiting this time of year is that the flowers begin to bloom. Also, the crowds are much less than during the summer months when it can get very hot along the Amalfi Coast. What is the weather like in September in Sorrento, Italy? September is considered one of the best times to visit Sorrento as the weather is very comfortable. You can expect daytime highs in the 80s with temperatures dipping to the 60s at night. Of course the weather is always something that can be unpredictable, but generally speaking, the month of September is a very good time to visit Sorrento and the Amalfi Coast area. I use a powered wheelchair. In Italy, are the boats, buses and trains wheelchair accessible? I believe that most of the public transportation options in Sorrento are wheelchair accessible. I know the boats and ferries are. The trains should not be a problem also. The buses could present an issue, some seemed to be accessible, but the buses do get very crowded. Sorrento itself seemed to me to be very wheelchair accessible. Check with your hotel to see exactly where they are located and if they provide a wheelchair accessible shuttle to various parts of Sorrento. My wife and I are going to Sorrento in October. Looking for train transportation. Any suggestions? What is the weather like in Sorrento in January? It's cool. January is the coldest month of the year in Sorrento with daily highs in the mid-50s, and lows getting down to the 30's at night. It's not the wettest month of the year, but it still averages about 14 days with precipitation during the month. As with any area, you can get great days during January, and you can get downright awful days, it's all a matter of luck. But, overall, compared to areas in northern Italy where they get a lot of snow it' really not that bad. I am going to Naples, Can I bring luggage on the ferry to Sorrento to stay for a few days? If not, how do I proceed? Yes, you can bring luggage on the ferry. Just make sure you purchase a ticket to bring your luggage with you, usually 2 euro per bag. What options are there for getting from Sorrento to Salerno, Italy? You have a number of options. You can do a one-way auto rental and drive the Amalfi Coast. You can take a train, although I believe you would have to go from Sorrento to Naples and then Naples to Salerno. Another option would be the Sita bus, but you will have to change buses I believe in Amalfi. During the peak seasons these buses can be very crowded so perhaps not a great option. You can also get there via the ferry system, which I would definitely consider. Again, you will have to change boats in either Positano or Amalfi, but this would be a way to get a unique view of the coastline. I suppose you could always hire a driver, but this might be on the expensive side compared to the other options. Many options. Guess it depends if you just want to get from point A to point B in the quickest way or see the coastline in perhaps a unique way. What is the weather like in Sorrento, Italy in mid-September? September is very nice in Sorrento. Day-time highs average about 80 degrees Fahrenheit while low temperatures at night average in the 60s. Certainly, the weather changes from early September to later in the month, but overall the heat of summer dissipates as the month progresses. September is not the driest month, but certainly better than October through February. Personally, I think it's a great time to visit, especially from mid-September on. Thank you Liz and a Happy New Year to you. Sorrento is on my list of places I would like to visit. Your article is an excellent reference for any visitor to the area. Hi Arthur. Enjoy Sorrento and the Amalfi Coast. It’s a beautiful area of Italy. Thanks Bill great info. Heading to Sorrento mid November can’t wait. Thank you Janisa. I think you would like Italy. Lots of history, architecture, ruins, and especially the food. Hi Julia. Thanks for stopping by. Have a great trip, you are going to love Sorrento and the surrounding area. I believe the seafood place was Porta Marina Seafood, very nice folks. Hi Kathleen. Glad you enjoyed the tour of Sorrento. Enjoy your second honeymoon trip. Ciao. Thanks for sharing the information about this great place. I am planning my second honeymoon trip to Italy and will definitely visit this exotic place. I have made the travel bookings with Benvenuto Limos, now after going through the blog, I will add one more day just to explore the beauty of Sorrento. Hi Christine. Thank you, glad you enjoyed the article. It's a beautiful area, so much to see and do. Enjoy your trip! Thank you so much for such an interesting read. We are doing some touring and Sorrento is one of the places we are visiting. So looking forward to seeing the area. Hi DTPS. Thank you. While I have not experienced the cooking classes at Villa Ida I did visit their website and read up on them with TripAdvisor. I will be adding this to our next visit to Sorrento. This looks like so much fun and they get nothing but wonderful reviews. I am completely confident that you and your gusts will have an amazing experience. Let me know how it goes after your visit. Ciao! Auguri Bill. This is one of the best articles I have ever read about an area I know well (visited 14 times always w/groups). My only question is that I have people going to cooking class at the "Villa Ida". Do you have any insight into this experience? Your hub brought back a lot of happy memories. We stayed just up the coast at a clif top boutique hotel in St Agnello from where it's possible to walk into Sorrento. Caught a rattling old train to Herculaneum - some seats had a notice above them which stated that they were "reserved for the war wounded"! Thank you cmoneyspinner1tf. Italy is amazing and certainly Sorrento and the Amalfi Coast area are beautiful and worthy of a visit. Thanks again for stopping by. Have a great day. Italy is a place I would love to visit but am unable to. However, so many people write about it and that enables me to go on vacation there quite frequently. Lovely HUB! Thank you Flourish. This one is an old hub but it was nice to see it get HOTD. Have a wonderful day. Congratulations on HOTD! Wonderful job as always! Hi Fox Music. That's great. You get to visit your son and see Italy. Doesn't get any better than that. I'm sure you'll have an amazing time. Just be forewarned, it can be addicting :). Thanks for stopping by and taking the time to comment. And a big thank you to your son for serving his country. Thanks for Sharing This Article "Top 10 Things to do in Sorrento, Italy" My Son Is In the US Navy and Will Be Stationed In Italy Later This Year So We Are Already Planning Our Trip As Well -- Congrats On Hub Of the Day !! Thank you Linda. You will love Sorrento and the Amalfi Coast. It's just beautiful. Sorrento makes a great place to stay to see the area with easy access to Positano, Amalfi, Pompeii, Capri and everything else. Thanks for the nice comments and I hope you get there next year. Hi Mike. Sorrento is just a beautiful place and the Italian culture is a great experience. Much different than here in the U.S.. We could learn a thing or two from the Italians. Have a great weekend. Congratulations on the HOTD award. A very well deserved one. Hi! bdegiulio, this is an awesome and beautiful hub about Sorrento, Italy. I haven't been there so hopefully next year we might visit this beautiful place. Thank you for sharing your hub and congratulations for your HOD. Well done. I feel like visiting this place! It seems like it would be a beneficial trip for anyone seeking to get to understand a culture. Thank you Heidi. The turquoise waters around Capri were absolutely incredible. We got to jump in and swim and it was one of the highlights of our trip. I can see us returning to this area in the future, it's really that beautiful. Have a great weekend. Hi Susan. Glad you enjoyed the tour. It was actually a few years ago that we were in Sorrento but it's still one of the most beautiful places that I have ever been. Thanks again and have a nice weekend. Oh my! I must not have been following you when you first posted this. Absolutely beautiful! 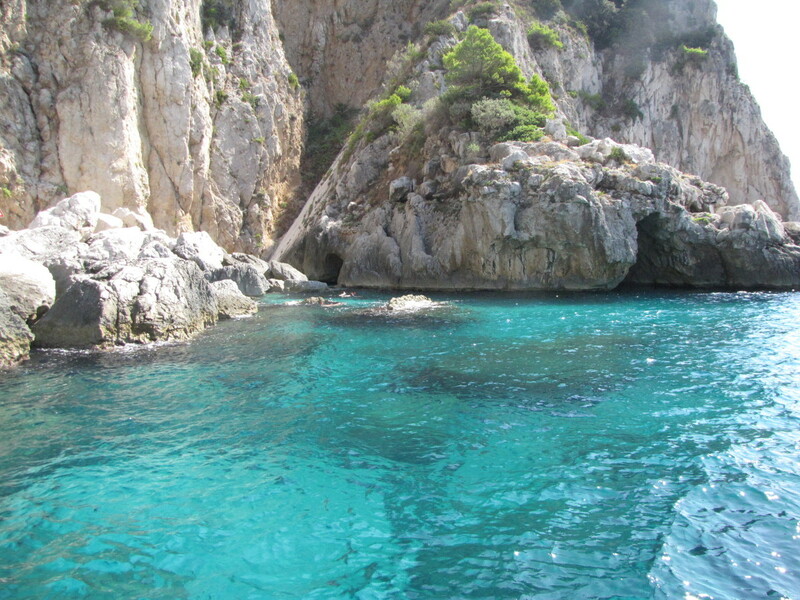 You hear about the turquoise waters around Capri and your photo captures it for sure. Like so many of your hubs, this is Hub of the Day worthy. Congrats and have a beautiful weekend! It is highly unlikely that I'll ever see the sights of Sorrento in person, so I thank you for the virtual tour. Congratulations on your beautiful and informative Hub of the Day! Thank you adevwriting. Glad you enjoyed Sorrento. Thanks so much for the vote, etc. Have a great weekend. Thanks Andrew. Glad you enjoyed the tour. That night shot is one of my favorites. We were on top of the hotel looking out across the Bay and playing with different camera settings. The view is really unforgettable and with the cruise ships out there it was an amazing sight. Thanks for the vote, share, etc., have a great weekend. Thank you Kristen. Didn't see this one coming as I wrote this hub a few years ago. Sorrento is still one of my favorite places. Thanks again and have a great weekend. Really enjoyed this article Bill, so welcoming and full of useful information, and your artistic photographs give it a certain edge. The night shot from your hotel with the glowing boats is a classic. Bill, congrats on HOTD! This was an excellent hub from you. Very useful for those who plan to travel to Sorrento Italy with this travelogue itinerary. Voted up! Thanks for reviving some wonderful memories. I and my sister stayed at the wonderful boutique Hotel Villa Garden in San'Agnello, from where it is possible to walk into Sorrento. A great place to watch the sunset is La Terrazza - but possibly with someone closer than your sister! Hi Roberto. Thanks for the tip and suggestion. We did not get to the Museum of Inlay Works but I did check out the link you included and it sounds very interesting. We'll have to check it out on our next visit to Sorrento. It's such a beautiful place with so much to see and do. Thanks again for the tip and for stopping by. Hi Bill, you miss a vist to the Museum of inlay works in Sorrento! You have to know that Sorrento is the birthplace of inlay, in '80s there was a great commerce of handmade wood productions by artisans in Sorrento, but in the last years there are only a couple of great artisans that still make handmade inlay. 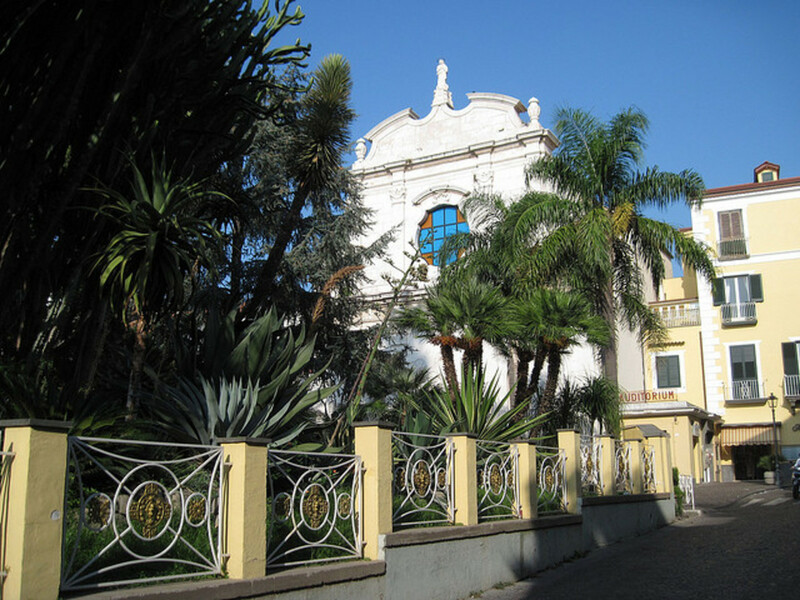 There is a selection of things to do in Sorrento on Etindo at this page: https://www.etindo.com/sorrento.html I hope that will be helpful to someone. Thanks Vesy. Bulgaria sounds beautiful. Hope to visit someday. You will love Sorrento if you get a chance to visit. Have a great weekend. I`m dreaming to visit this picturesque place. In Bulgaria we have picturesque places, too. The next time I can write about Bulgarian`s nature, for our mountains,the oldest thracian`s places in our land. Trigrad Gorge in Rhodope mountain is incredible magmetic place with your`s history. Hi Vesy. Thank you. Sorrento is a wonderful destination with so much to see and do. Between the Amalfi Coast, Capri, Vesuvius and Sorrento itself there is plenty to keep you busy. Thanks for stopping by, have a great day. Very beatiful place I want to go there after I read your hub. Hi Ryan. Thank you. It's a beautiful area with so much to see. Hope you get there soon. My hanks for stopping by. Hi Kelly. Thank you. Glad you enjoyed Sorrento and the Amalfi Coast. A wonderful place to visit if you ever get the chance. Have a great day. Another wonderful place we can all visit thru your experience. Thank you Ana Marie. We really enjoyed Sorrento and the Amalfi Coast. It really is a beautiful area. Thanks so much for stopping by, have a great day. Italy is beautiful . The things to do are a lot of fun. The pictures look good. Thank you for the travel hub advice. You are wonderful Mr.bdegiulio. Hi Kat. It's one of my favorite places also. There is so much to see and do close by. Sorrento makes for a great base from which to explore this beautiful region of Italy. We loved Mount Solaro also. We can't wait to return someday soon. Thanks for stopping by, have a great weekend. Sorrento is one of my all time favorite places to go in Italy. The town itself is extremely charming and there are so many great places just a short walk, train ride or boat ride away. I really enjoyed the chairlift ride to Monte Solaro in Anacapri and I agree that the Blue Grotto is cool, but more of a tourist trap. I've yet to get to Positano, but after reading this it's definitely going to be a stop next time I'm in the area. Thanks for the great post. Hi Adventure Lover. Glad you enjoyed Sorrento. It's a great place to visit and it makes a great base for exploring all that this region of Italy has to offer. Thank you. I really enjoyed this hub. Thank you again Susan. As you have probably surmised I have a thing for Italy. Thanks again for the visit and the vote. Hi Suchita. Thanks for stopping by and glad you enjoyed Sorrento. It's a beautiful area if you ever get the chance to visit. Appreciate your writing, pictures and efforts. Fantastic article for travellers. Thumbs up. Hi IslandBites. Thanks for the comments and welcome to HubPages. Hi freecampingaussie. I'm jealous. Lucky you to have been in Sorrento just last week. We also got to swim at Capri and this was certainly a highlight. We love this area, glad you enjoyed it. A helpful hub . We had an amazing time there last week ! Loved the whole area including swimming at Capri , the Amalfi coast etc ! 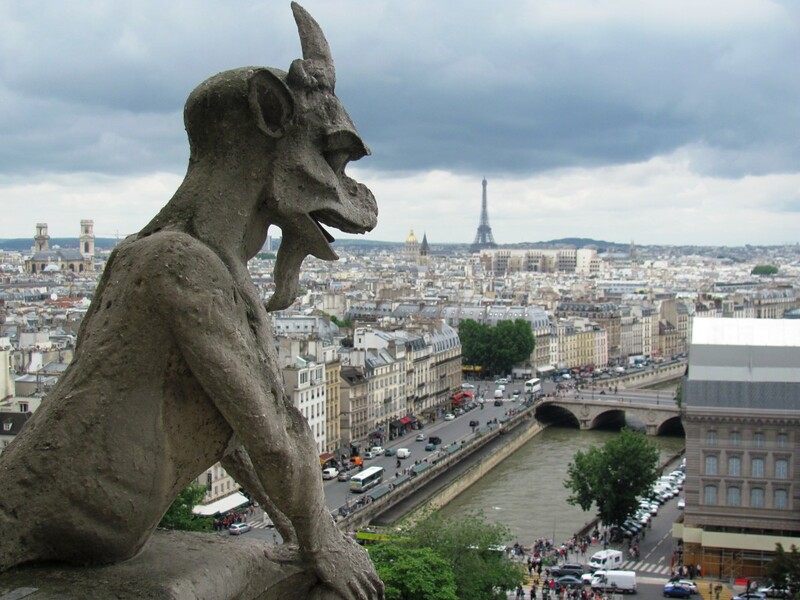 Oh how I wish I could visit here some day. Looks peaceful and relaxing! Here are some other great things you may enjoy. Hi there Shinkicker. Thanks for the visit and the VU, glad you enjoyed Sorrento. Beautiful hub with terrific pictures amongst useful information. Hi baja203. You are very close to Italy, I am envious. I'm sure you will get there soon enough and enjoy all that Italy has to offer. Thanks so much for the visit. Hi Tasha. Isn't Capri just wonderful. We liked it so much that we are planning a return trip for this fall. Can't wait. Thanks so much for the visit. Thanks srsddn. We really enjoyed Sorrento. 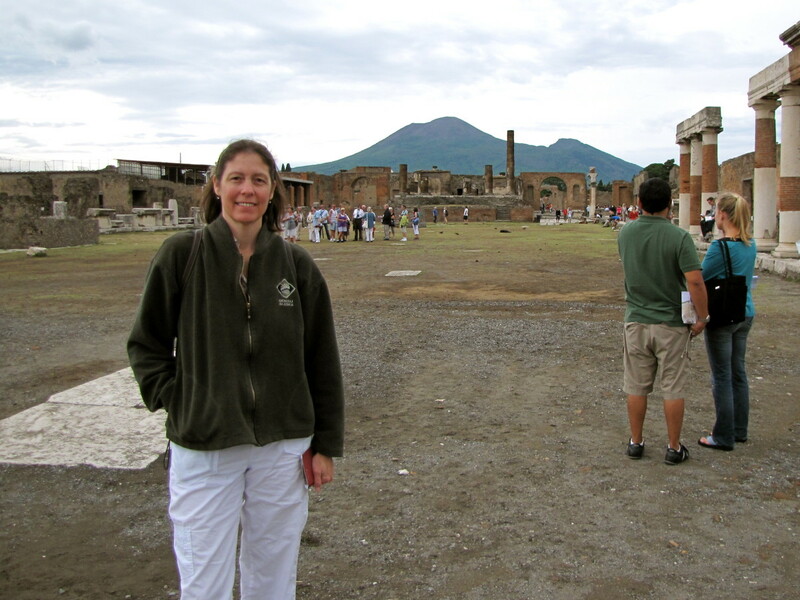 Makes a great location to tour Pompeii, Amalfi Coast, Capri, etc. Thanks for stopping by. Hi, bdegiulio. Old Sorrento looks like any other congested city, though neat and clean. 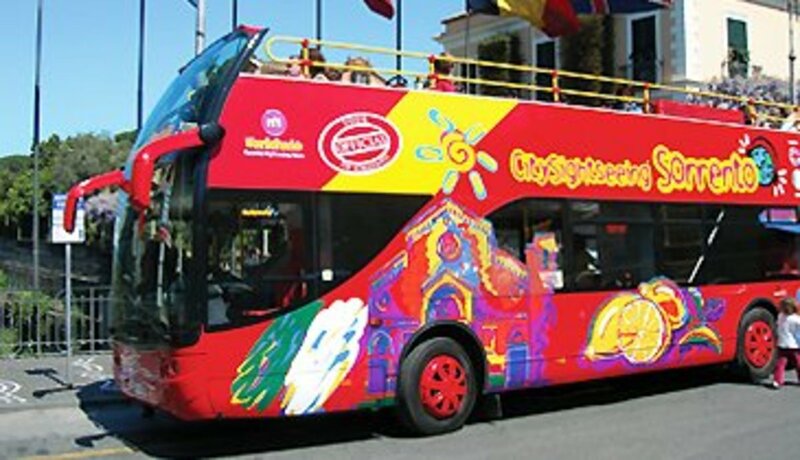 HoHo buses are getting popular at many tourist destinations. It is a good facility at Sorrento. Night view is gorgeous. Thanks for sharing such a beautiful station in Italy. Hi Elias. Welcome to HubPages. Thank you for taking the time to read and comment. Sorrento is amazing. Ciao. Wow! Amazing hub & some marvelous places to go to! Voted up & awesome! Cheers! Keep it on your list, it is a beautiful area. We really enjoyed Sorrento and the Amalfi Coast. I loved the photos in here - voting you up for an informative hub ! I have been to Italy but not this part . Now it is on my Must see list ! Hi TravelinJack. Thanks for stopping by. We loved Sorrento also. We stayed in the Hotel Il Nido located in the hills above town. Great place. We would love to return to Sorrento someday. Thanks for stopping by. I love Sorrento, great jump off point for the Amalfi coast. Did you stay at the Seven Hostel by any chance Bdegiulio? Great place. Hi Sam. Thank you. We still long to return to Sorrento. Just a really beautiful part of Italy. Thanks for stopping by, have a great day. Great hub. Having visited Sorrento about a year ago I can certainly agree with the selections that your beautiful photography has immaculately captured. This makes me long to plan a return journey! Hi Shelley. You will love Italy when you get there. So much to see and do and the food is to die for. We've made 3 trips and it's not enough. Here's hoping you get there soon. Thanks for reading, VU,etc. What a wonderful beautiful read. Italy is on my bucket list, who can die and not see Italy? Up, interesting and beautiful. Hi Rich. I hope you get there soon. And bring plenty of memory, you'll be taking lots of photos. Thank you for the read and nice comments. Have a great day. What a great article, although it makes me extremely envious because I haven't been there YET! If and when I do get there, I will probably wear out my camera based on what you've shown (as well as others). Great shots! I will be following you from now on! Hi radhikasree. Thank you for the nice comments. It's is an easy place to capture as it's just so beautiful. So glad that you enjoyed the Hub. Hopefully you get the opportunity to visit some day. Have a great day. Enjoyed reading this travel hub. 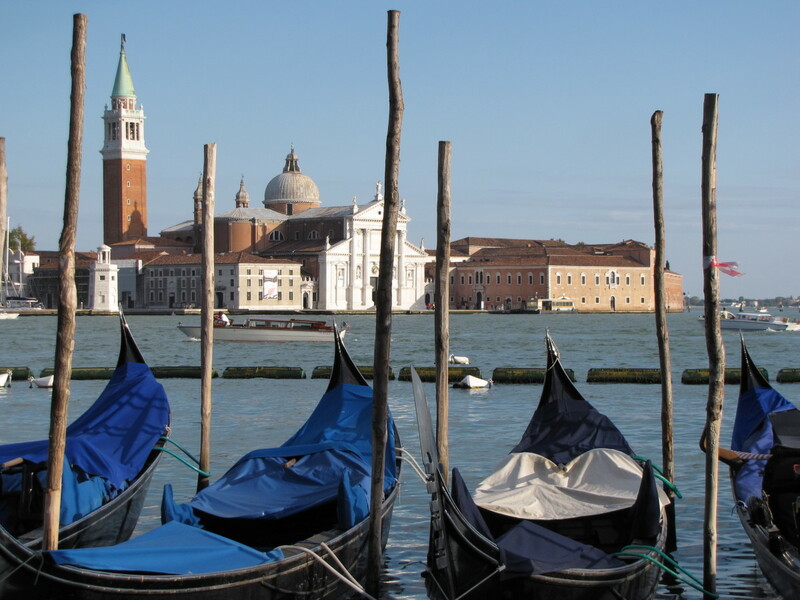 I have heard about Venice from my husband who has to make several official tours to Milan. You've captured the real beauty of this God's place and it's wonderful. Hi Marlene. Thank you for the very nice comments. It is a beautiful place if you ever get the opportunity. Thanks again and have a great day. What an attractive place to visit. Your photography skills are extraordinary. You captured the beautiful landscape magnificently. Seeing and reading about Sorrento makes me want to add it as my next travel destination. Hi Emma. Didn't you just love this area? Beautiful and lots to do. 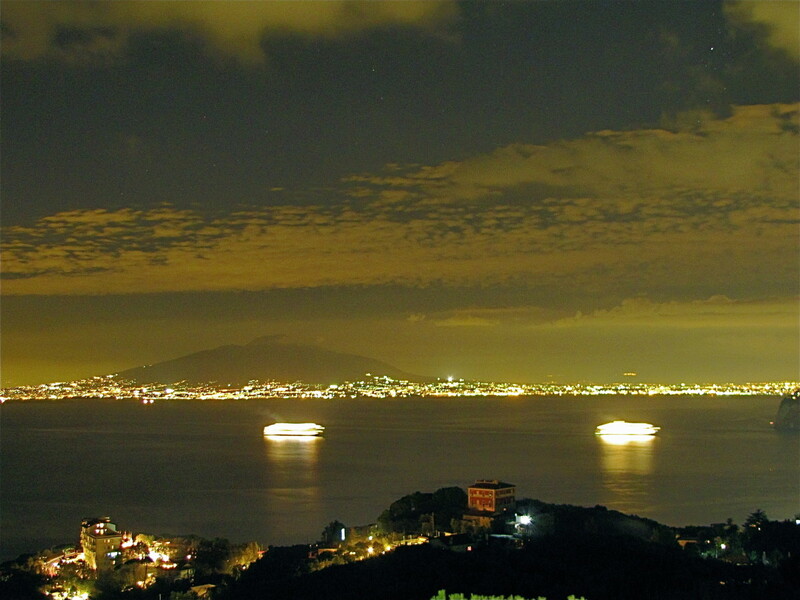 I still miss that view out over the Bay of Naples. Sounds like you had a great trip. Thanks for stopping by to read, comment and the vote. Great hub - voting up and awesome. What a great place. Very useful information and beautiful ! Hi Meldz. Thank you for stopping by to read. It really is a beautiful part of the world, certainly worth a visit someday if you get an opportunity. Appreciate the read, comment and vote. Thanks for this useful hub. I enjoyed your pictures. Voted up and more. Hi Suzie. Maybe someday we'll entice Mr. Bill to cross the pond and see La Bella Italia? Until then I think we just keep throwing this stuff at him. So glad that his brought back great memories. Did the same for me. What a story getting back from Capri, it's always funny after the fact. It is quite a climb from the marina back UP into town. Something I'm sure you'll never forget. As always thank you for the vote, share, etc. Don't you just love billybuc!! lol Conspiracy absolutely! Great job on Sorrento my friend, oh the memories came flooding back!! 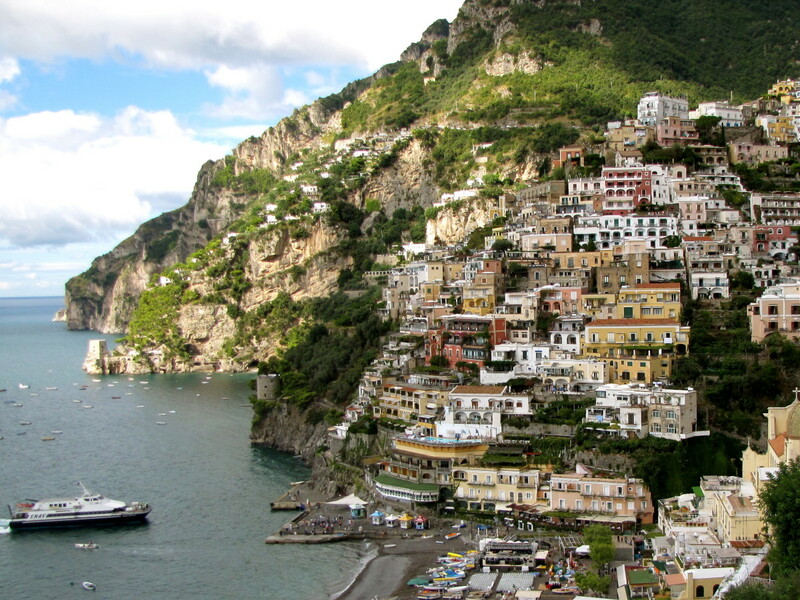 Your highlights are spot on - Amalfi Coast, Positano, Capri all definitely worth a trip. All favourites of mine too. I laughed when I saw the steep walk down to marina grande. After returning from glorious sunshine on Capri, we were met by TORRENTIAL rain and floods by the marina. Mass hysteria, rip off taxi's and no buses left us to walk up the incredible incline, two drowned rats was not close! Ha, funny now looking back but not at the time! Superb hub,yet again you always bring to life La Dolce Vita in glorious technicolour, voted everything and sharing!!!! Thank you hawaiianodysseus. Writing these hubs on Italy just keeps it fresh in my memory and brings back such great memories. How nice that your son got to study in Italy, I'm sure it was a great experience. Thank you for reading and the nice comments. What magnificent photographs to complement your outstanding writing! You've got a wonderful niche going. 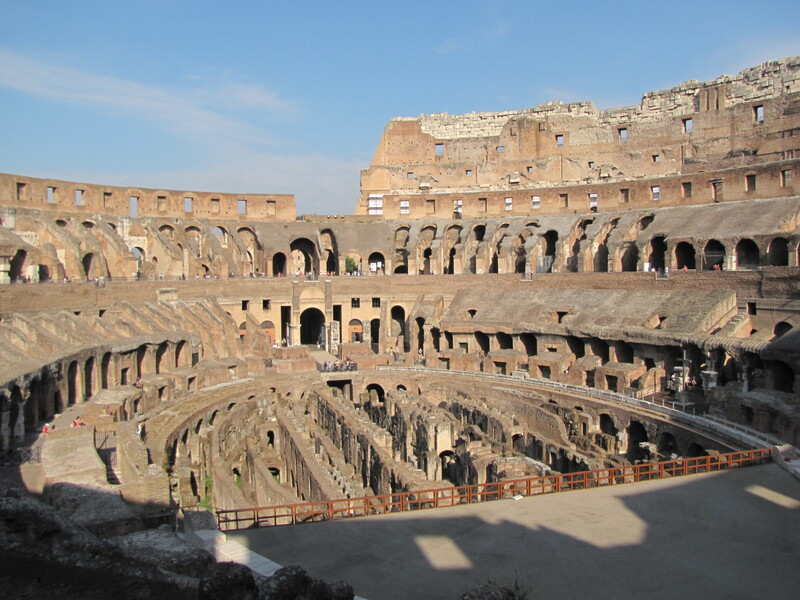 As I read your Hub, I was reminded of my son's three months of graduate studies in Italy and the picturesque photographs that adorned his blog about touring Europe. 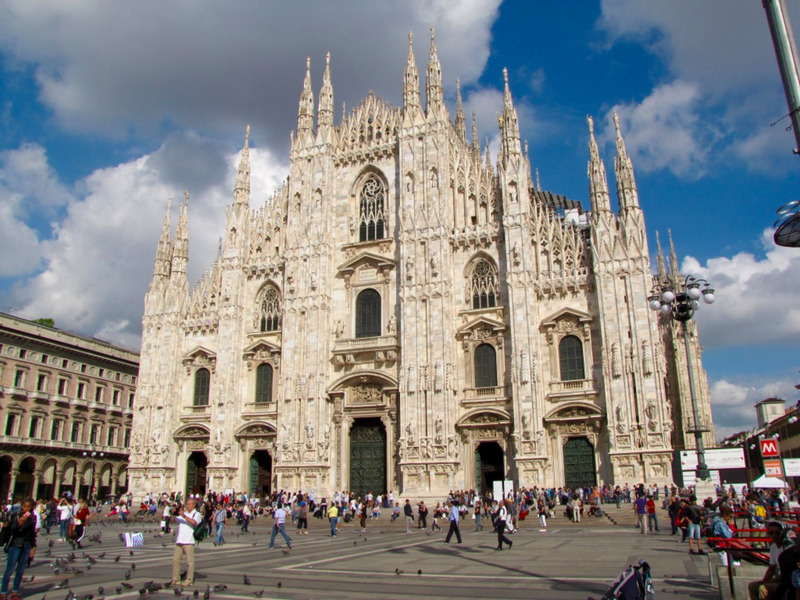 I especially loved the Italian architecture, and your Hub only served to underscore the intrigue and beauty of Italia! Hi Prakash. You know first hand how beautiful this area of Italy is. Now that you mention it I do remember seeing a lot of furniture shops while we were there. We just really enjoyed this area of Italy, so much to do and it's just so beautiful. Thanks so much for the nice comments, I'm glad you enjoyed reading it as much as I had putting it together.